The democratic process is working in Pacific Heights, thanks to Supervisor Catherine Stefani. In September, Supervisor Stefani successfully stalled the placement of three Ford Go Bike stations proposed for Pacific Heights — including at Alta Plaza Park — thanks in part to the members of this group’s opposition to an anemic and haphazard community input process and a lack of data justifying site selection and expansion. This Fall, I asked both Supervisor Stefani and Candidate Nick Josefowitz to personally share their positions on bike share. Supervisor Stefani said that she is continuing to work proactively with Ford Go Bike to relocate stations in our district. She stated that she is using her deep community relationships to identify how neighbors feel about various options before they are presented at a public hearing. Candidate Josefowitz, who I contacted about Ford Go Bike when the Alta Plaza station was proposed while he was a BART Supervisor (no support was forthcoming), said that he supports bike share. He shared studies citing how bike share could reduce the city’s carbon footprint. When asked for data to back up Ford Go Bike’s plans, including usage data, site selection criteria, and lessons learned from failed bike share programs in other cities, Candidate Josefowitz provided more policy research supporting bike share. He conceded that he would get input from the community on site selection. Candidate Josefowitz is endorsed by The San Francisco Chronicle and State Representative Scott Weiner, who shares with him the priority of building more housing supply near public transportation. Candidate Josefowitz’s wife was a former senior manager at Lyft, which owns Ford Go Bike. She stepped down from her position due to conflict of interest and to support her husband’s campaign. Obviously, bike share is not the only, nor the most important, issue in the Supervisor’s election. Both candidates understand that homelessness and housing are key. Supervisor Stefani, a lawyer and former county clerk whose brother is a drug addict, is a strong proponent of conservatorship. 50% of the homeless are mentally ill and/or drug addicted, and the unpleasant but compassionate solution is to force them to receive treatment. Candidate Josefowitz’s central argument is that the City needs to build more shelter beds. He also believes in using data to stay on top of the homelessness problem and supports conservatorship. Ultimately, the decision may come down to character and which candidate will be best able to get results at City Hall. Supervisor Stefani, a life-long public servant, is committed to her community and a valued member of Mayor Breed’s team; Breed approvingly called her a “bridge builder.” Will her strong relationships with Mayor Breed and City Hall staff help her drive change? Candidate Josefowitz is relatively new to the political scene, independently wealthy, ambitious, an outsider, and keen to solve problems; he has ruffled a few feathers with his aggressive campaign but asserts that City Hall needs a shake-up. Will his outside money and influence help him drive change? While both are excellent candidates, my vote will be with Supervisor Stefani on November 6. Why? The outcome is the evidence. We saw in 2016 what happens when votes are cast out of fear and frustration with the status quo. In contrast, Supervisor Stefani asserted today: “Kindness in politics is a strength, not a weakness. I’m here to not do things TO you, but to do things FOR you.” Change is complex and incremental — it’s just a fact of life, and of politics. Supervisor Stefani may not be a radical choice, but she has proven that when our community speaks, she listens. Yet though this was Stefani’s publicly stated cause for opposing Motivate and Ford GoBike, in a small community meeting with the Pacific Heights Residents Association in April she gave other reasons for opposing the program’s expansion. Dockless bikeshare programs like Uber-backed Jump, she said, were far more modern than bikeshare programs like Ford GoBike which rely on docks to operate. “I still think it’s opening Blockbuster Video stores when Netflix is out, I think this is the old way of doing bikeshare,” she told her constituents. When asked to explain the comment, a staffer for Supervisor Stefani, Wyatt Donnelly-Landolt, said the supervisor is supportive of bikeshare, but stressed neighbors were given little notice. I noticed that District 2 Candidate Nick Josefewitz was profiled as being "an ardent bike share supporter" so I reached out to him to clarify his views. 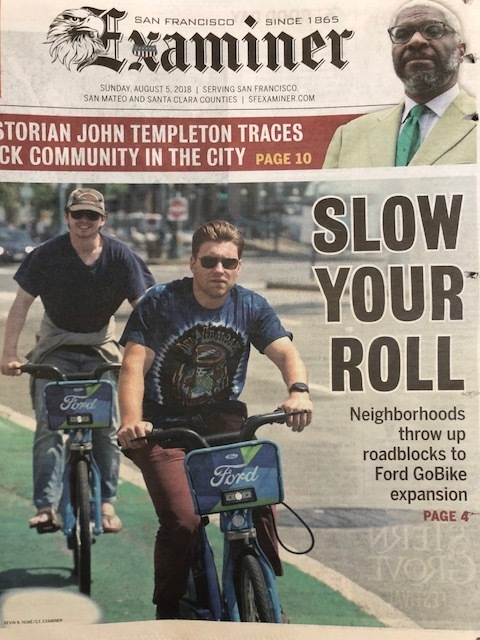 I just saw the front-page Examiner story on Ford Go Bikes, which paints you as an “ardent bike share supporter” and essentially endorses Supervisor Stefani on this issue. Can you please clarify your position? As you know, our neighbors are strongly opposed to docked bike share on residential blocks but ok with dockless bikes, docks in commercial areas (such as in the parking lot across from Mollie Stones), and regular bike racks. It’s important that you make your position on this issue clear, and I am happy help clarify your position to our neighbors in the event that the Examiner piece was misleading. Thanks for reaching out to help me clarify. I am a big bike share supporter. Jump bikes (electric dockless) have transformed how I and many others get around the city, and would strongly advocate for removing the artificial cap on the number of these bikes. With regards to docked bike share stations, I think they should be cited in neighborhoods with proactive, authentic, and responsive community engagement. In many neighborhoods, that will concentrate the docks in the locations that you mention (eg the parking lot opposite Mollie Stones). But in other neighborhoods, community input may lead to a different outcome and docks could be located on residential streets or on private property or in any number of places. I don't think we're on a different page here. I am on a different page to Sup Stefani, though, who seems to not want any docks anywhere. I hope this additional insight is helpful to everyone. May the best candidate win come November! Supervisor Stefani has deep roots in District 2, raising a family here, and serving as legislative aide for D2 Supervisors Michela Alioto-Pier and Mark Farrell for almost a decade, and most recently as San Francisco County Clerk. Hear Supervisor Stefani’s priorities for our district, and what she sees as challenges citywide and to our quality of life. Take this opportunity to share your input about what you feel we need, and what you’d like to see her work on. Just learning about SFMTA's plans to place a Ford GoBike Station on Alta Plaza Park? Please download the attached memo to get up to speed, read sample opposition letters, and find out what you can do to help. The following article appeared in the print edition of the Financial Times on March 2, 2018 -- it speaks to the challenges that bike share programs have faced in Europe in creating a viable business model due to rampant vandalism and theft. It would be interesting to hear from SFMTA and the City how they plan to learn from other city's experiences in setting up the San Francisco bike sharing program for success. In addition, this article shows that our neighborhood's concerns about vandalism and theft negatively impacting neighborhood safety as well as beauty of Alta Plaza Park, one of the most attractive parks in the city, are legitimate concerns. Bike sharing stations should be placed in commercial areas where vandalism will be deterred because of dense pedestrian presence and existing surveillance systems, not on a quiet residential corner. Thank you for your communication regarding the proposed GoBike station(s) in District 2. I’d like to reassure you that the SFMTA is committed to working with Supervisor Stefani and the District 2 community to address concerns about GoBike station deployment in the area. We have all agreed that it makes sense to pause any proposals or plans for proposed sites in District 2 until the supervisor has more time to get caught up on all the historic and current GoBike information, plans, and proposals. Supervisor Stefani has asked us and Motivate, the owner/operator of the GoBike system, to partner with her on hosting another community meeting in your area (a public workshop was hosted at the Hamilton Rec Center in January of 2017). This second meeting will be an opportunity to have an open conversation about the station siting processes which are currently in place for District 2 and a dialogue about alternatives. Please stand by for more information on how to stay involved in the conversation. The GoBike system furthers the City’s ambitious adopted goals and policies around supporting and promoting bicycling as a safe, affordable, healthy and clean everyday mode of transportation. The City’s public-private partnership with Motivate will bring San Francisco an expanded bikeshare system at no capital or operational cost to the public. Thank you again for reaching out about GoBike. We look forward to working with the District 2 community over the coming months. Please know upfront that I share your concerns. My Legislative Aide Ellie Miller Hall went to the hearing to express our reservations about these three proposed sites based on what we have heard from you. You have all raised questions about the placement of the proposed locations, and also asked for full design mock-ups of what the stations will look like. We also understand that although many of you were able to attend Friday’s hearing, many of you were not because you didn’t receive notice from an expressed lack of notice on the hearing date & time. You and your fellow community members at the hearing also expressed distress regarding a consistent lack of public outreach from the SFMTA & Motivate on this program. I have connected with leaders at the SFMTA & Motivate to raise concerns echoed throughout our district. I have encouraged them to conduct a stronger public outreach process surrounding proposed site locations & hearings in conjunction with our office. I am determined to make certain that these stations are located in areas where we have community buy-in and demonstrated need. Through my follow-up conversations with the SFMTA, I have been assured that they have placed a hold on all Ford GoBike permits in District 2 until our office is presented with all information, plans, and proposals. I have also been assured that the SFMTA and Motivate will provide statistics & demand studies showing neighbors who expressed support for Ford GoBike Stations in District 2 at the three specific locations mentioned above. We also have asked for site visits at locations so I can view and understand the choices firsthand and also review alternative site locations proposed by many of you. Our office is also planning to host a community meeting with the SFMTA, Motivate and all concerned residents to have an open conversation about the processes which are currently in place for District 2 & a dialogue about alternatives requested. I believe we must take into consideration the opinions of those who oppose these specific locations & also those who would like to use these bikes as a means of transportation. I am committed to making certain we have consensus before any stations are created in our neighborhoods so that all parties are seen and heard. I have confirmed, and the SFMTA also agrees, this outreach was part of the deal. I look forward to hearing your ideas and further comments about this process. We will keep in touch with you all on further updates. 2) A historic residential neighborhood is not an appropriate place for a commercial enterprise and commercial advertising. 3) Jump dockless bikes are a better fit for this hilly residential neighborhood because they are electric and do not require commercially branded stations. 4) Families with young children drive cars and are some of the biggest users of the park. They need the parking spaces on the park perimeter to transport their children. The Ford GoBike station will take away parking spaces. 5) Ford GoBikes are prone to vandalism, which will mar the beauty and safety of the park and neighborhood. Commercial streets, with their heavy pedestrian traffic and existing safety and surveillance systems, have more "eyes and ears" to deter vandalism, and are therefore a more appropriate place for bike sharing stations. 6) The Ford GoBike station will reduce the property value of neighboring homes with park views. Below is a map of the planned expansion of Ford GoBike stations in Pacific Heights. There are a disproportionately large number in the vicinity of Alta Plaza Park. This is a beautiful residential and commercial neighborhood; the intrusion of multiple bright blue Ford branded bike stations and advertising panels will be an eyesore, let alone at Clay and Steiner on one of its loveliest residential blocks. PLEASE JOIN US IN OPPOSING THE CLAY-STEINER FORD GOBIKE STATION TODAY!